As part of the Rhizomatic P2PU course‘s theme around “cheating as learning” with Dave Cormier, I offered up a poem for others to steal and remix. It was a sort of call to arms, partly as poetry about the remix culture and partly to see if what I view as a rhizomatic concept (that of ideas twisting, turning and being reshaped as we make sense of experience in unexpected ways) might actually take place. You never really know, when you toss something into the wind, whether it will take root or not. My poem — Steal This Poem — was an invitation to others to take what I wrote and do what they want with the words. I didn’t claim ownership. When I hit publish, the words were no longer my own. In fact, it was quite the opposite. I wanted to set the words free. I know that sounds rather esoteric, but I was curious about whether the world of digital writing — where anyone can steal anyone’s words rather easily — might be a larger canvas for collaboration, and whether we could turn the word “theft” on its ears, and make it a door for creativity. The unknowns were whether anyone would read the poem, care about the poem, and figure out a way to remake the poem. That’s a lot of unknown elements. Whether anyone would take me up on the idea of stealing my poem or not, I honestly had no idea. While Terry Elliott and I had done some remixing of poetry a few weeks earlier (Ice&fire&memory&music&songs&dreams), he and I know each other, and so it was less of the unexpected happening with the two of us. We collide all the time. What if others I didn’t know quite as well were involved in a remix venture? Would it work? Or would the poem fall silent upon release, shackled forever on my page? I didn’t know. It was a worth a try, though. I let the poem go and hoped they would come. First Maureen responded (first as a poem and then as a media remix), and then Cathleen used her voice to recraft the delivery if not the poem itself and then last night, Tonya shared out her remix of the poem, complete with fingerpainting and diagramming and counter-verses. All three of three remixed projects are so very different and bring a unique stance to the words and ideas. And Sandra used the poem in her class as an anchor piece of writing around poetry and remix culture. Take Cathleen’s version. She “heard” it as a slam poem of sorts, and added a soundtrack and her own voice, giving the poem a beat edge to it. Fingers snapping, she finds new places in the poem to add emphasis, and the swirling, swelling electronica behind her is interesting. 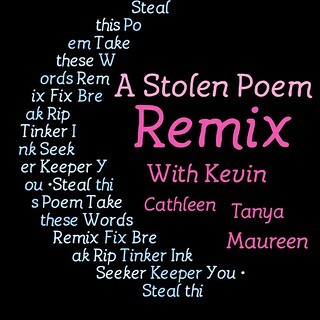 She used part of the poem, not the entire thing, and that allowed her to focus on the central message of the remix. It’s a fascinating aural experience. Maureen went two routes. First she crafted a poetic response in Google Plus. Her second remix was a media remix. She used a site called Weavley, and with my voice booming with reverb, she put the poem to movie clips of theft and stealing from The Reader and The Book Thief. I find it intriguing how my eyes watching the video seem to take precedence over my ears listening to the poem (or maybe I am sick of my voice). Turn the volume off on the remix and think about what feeling the clips bring up. Turn the video off and listen to the poem. Then, do both. I’m struck by how the media informs the meaning. 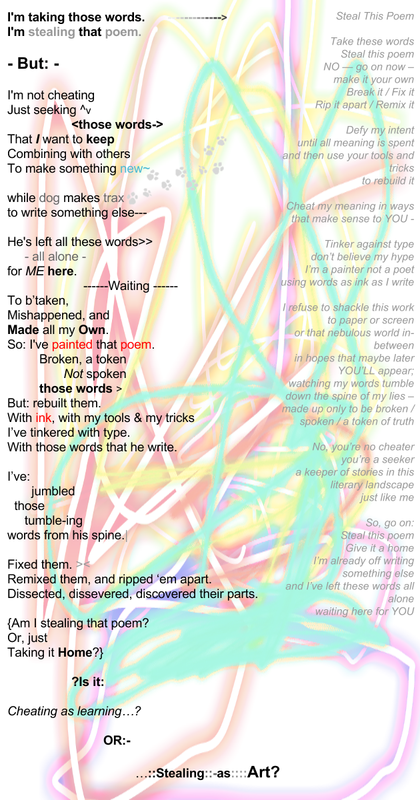 Finally, last night, Tonya (who kept me updated on her attempts via Twitter), released her poem remix, too. You have to read her reflection on how it came together, which in itself is a gift. Her remix is like a call-response, and I love how she laid it out, using fonts and colors to expression emotion, and used a poem to talk to a poem. It’s a poem for two voices, fingerpainted by her three-year-old child. I’m grateful to be the victim of the theft. The poem has come home. But go ahead, steal it again. Make it your own. If you already did a remix, but I never saw it or forgot it, please drop me a link in the comment box so I can add it in. This entry was posted in P2PU Inquiry, Poetry and tagged #rhizo14. Bookmark the permalink. Thanks again for this wonderful opportunity for others to be creative and remix together. This intrigues me as an model for classroom use. Perhaps when educators practice the arts of creative remix in our lives and own PD classes and others, we can model the kind of curiosity and risk- taking that might make our students more independent and “joyful” learners who self remediate and self assess along the way. Oh.My.God!! Maureen – just watched your reverb-book thief remix – it is Amazing!!! I love the concept, love the execution. Very deep. See what you’ve started? Can’t wait to see what others may do. The story is building….Loved the Ice & Fire &…remix. Can’t imagine what you and Terry Elliot are going to cook up next. I totally agree Cathleen – I Love how Kevin’s challenge to steal has inspired a creative undercurrent to emerge in rhizo14 > and how you’re tying it into this concept of an ‘Arts and Crafts tent’. Rhizo14 has evolved from ‘party’ to full blown ‘festival’!! I now realise what ‘community as curriculum’ really means…. The ted talk on remix culture. It just says it all there, the things about copyrights and patents that kill creativity. You guys just proved what Kirby Ferguson was trying to say. Toni. I shared Kirby’s in my week 1 blog. Remix and sharing is central to this type of learning. We are trying to demonstrate that with our Arts & Crafts Tent. Won’t you join us at the Festival? Oh, hi Cath, sounds tempting. I am squeezing into the Arts and Craft tent to watch the show and add my own take. http://bit.ly/1mVse7N Maureen I loved your media remix!! In fact I am really enjoying all the different version, stolen, cheated and celebrated!!! Let’s keep the Arts and Craft Tent open. No need to squeeze into the tent, Maureen. There is plenty of room. Invite your friends! Loved your remix. And reply the reply added.